Which are the competing players in the major technology markets? How are they positioned to help you over the long haul? A Gartner Magic Quadrant is a culmination of research in a specific market, giving you a wide-angle view of the relative positions of the market’s competitors. 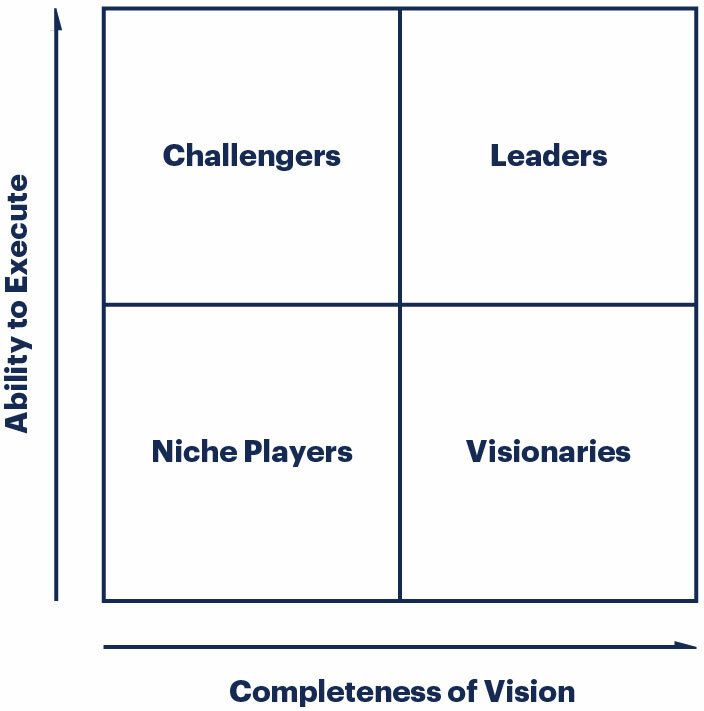 By applying a graphical treatment and a uniform set of evaluation criteria, a Magic Quadrant helps you quickly ascertain how well technology providers are executing their stated visions and how well they are performing against Gartner’s market view. How do I use a Gartner Magic Quadrant? Use a Gartner Magic Quadrant as a first step to understanding the technology providers you might consider for a specific investment opportunity. Keep in mind that focusing on the leaders’ quadrant isn’t always the best course of action. There are good reasons to consider market challengers. And a niche player may support your needs better than a market leader. It all depends on how the provider aligns with your business goals. Gartner’s interactive Magic Quadrant features enable you to create a view of the Magic Quadrant to reflect your own business goals, needs and priorities. Most significantly the interactive features enable you to adjust the weightings applied to each of the evaluation criteria to generate a new, client-specific Magic Quadrant graphic for that market. You can then save and share these customized Magic Quadrants for your internal analyses and decision making. Gartner’s interactive Magic Quadrant also brings together our expert opinion and the Peer Insights user-contributed reviews into one experience. User Review tab enables you to read and evaluate what your peers have to say about the enterprise IT solutions they have implemented and use in their enterprise on a daily basis. Contextualization enables you to view a Gartner Magic Quadrant through a specific lens, providing high-impact additional perspectives by key industry, region and company size. This enhancement provides analyst commentary on the market and notable vendors from key client contexts. The interactive Magic Quadrant experience provides you with a customized view of the market based on the criteria most important to you.